"Henry Augustus Eaton was born in Granville, Vt., Nov. 8, 1838. He graduated at Middlebury College, Vt., and intended to study law. During the Free Soil contest, and soon after his eighteenth birthday, he responded to the call from Kansas and remained there until the issue between Freedom and Slavery was decided. Thoughtful and eager for knowledge from his youth, he secured a liberal education, largely by his own exertions, graduating with much honor from Middlebury College in 1862. 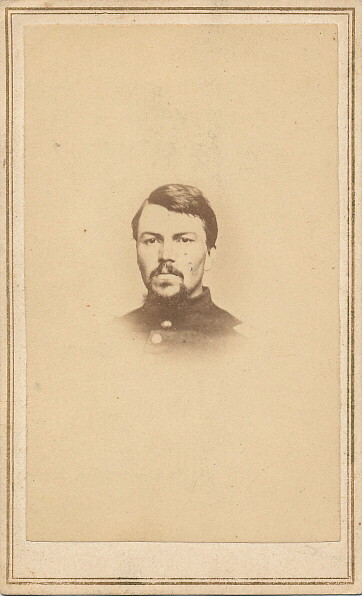 He at once enlisted for nine months in Company A, 16th Vermont Volunteers, and was the unanimous choice of his company for captain. The regiments took part in the last two days of the battle of Gettysburg, occupying an important position in the line. There he distinguished himself by remarkable coolness and an almost reckless bravery, until severely wounded. At the expiration of his service, and even before he could move with safety, he zealously worked in Bethel, Vt., to raise a company for three years' service in the Seventeenth Vermont regiment, and was again elected captain. The regiment shared in the terrible battles of the Wilderness and was almost annihilated. Captain Eaton had been detached from his command to serve as commissary, and afterwards as aid on Gen. Griffin's staff. At his own request he was relieved to return to this regiment, of which he had command during the absence of the wounded colonel. At the battle of Poplar Grove Church, Virginia, Sept. 30, 1864, he was killed while leading his men. Not long before the battle he had been commissioned major, and shortly after, before his fate was known, he was made lieutenant colonel. His heart was with the defenders of the Union, and he was ready to die in the discharge of duty. Everywhere his faithfulness and ability secured confidence. As an office, "his eye was quick and accurate; his self-possession never forsook him; his fidelity was unquestionable and his ardor never cooled." His name, with the names of forty other Rochester soldiers who gave their lives to their country, is inscribed on the soldiers' monument in that town, and the Grand Army Post is named for him. It is the testimony of all who knew Colonel Eaton that he was nearly faultless. He had no bad habits; he was pure in heart; he loved his fellow-men; he was as modest as he was brave. Such a character was worthy of the heroic age in which he lived and the great cause for which he died. Although Henry Augustus Eaton was buried on the battlefield and his brother Eugene Edgar Eaton died elsewhere (presumably Malden, Mass. 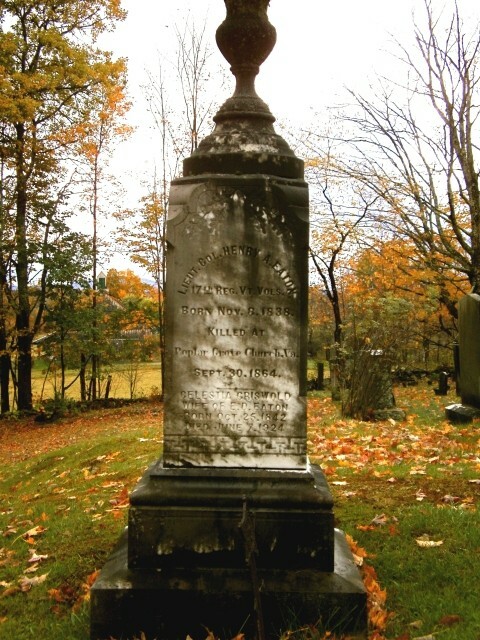 ), both are named on the Eaton family monument in North Hollow Cemetery in Rochester, Vt. Source: Thomas Bellows Peck, Richard Clarke of Rowley, Massachusetts and his descendants in the line of Timothy Clark of Rockingham, Vt., 1638-1904 (David Clapp & Son, Boston, 1905; reprinted by Tuttle Antiquarian Books, Rutland). Contributed by Susan F. Eaton, Middlebury, whose husband, Maxwell Eugene Eaton, Jr., is great-grandnephew to Henry and Eugene.